Even in a destination as packed with luxury accommodations as New York City, there’s always room for 1 more. 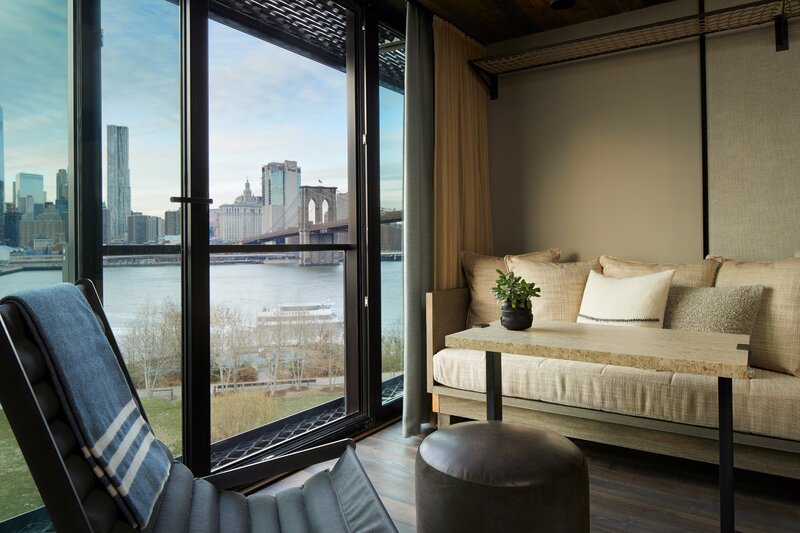 Fresh on the scene since February, 1 Hotel Brooklyn Bridge is primed to be a must-book for eco-conscious travelers looking to trade in the bustle of Manhattan for the greener (in every sense) pastures of Brooklyn Bridge Park. 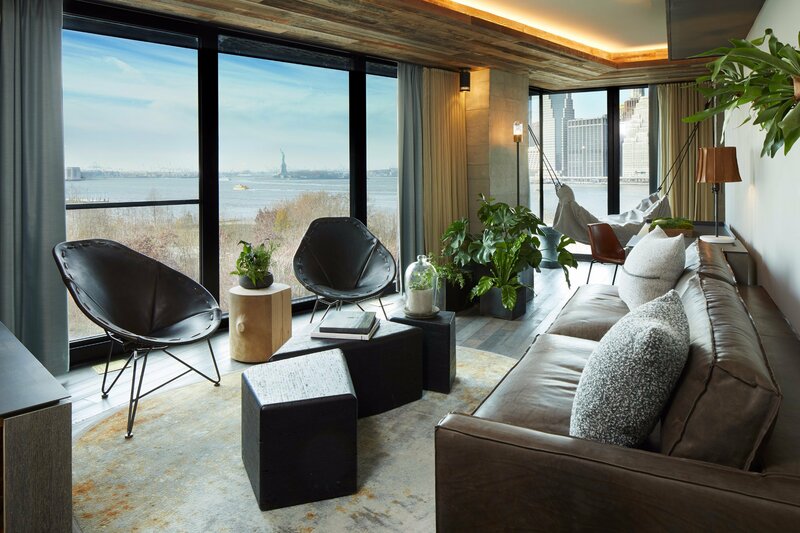 The third and latest iteration of the 1 Hotels lifestyle brand­­­­­­ (with sister locations in Central Park and South Beach) is pairing their core philosophy of melding eco-friendly design, sustainable architecture, philanthropic partnerships and superior service with the allure of East River panoramic views. Combining west coast chill with the thrill of the Big Apple? Hallelujah. It won’t take you long to see why this brand isn’t called 2. 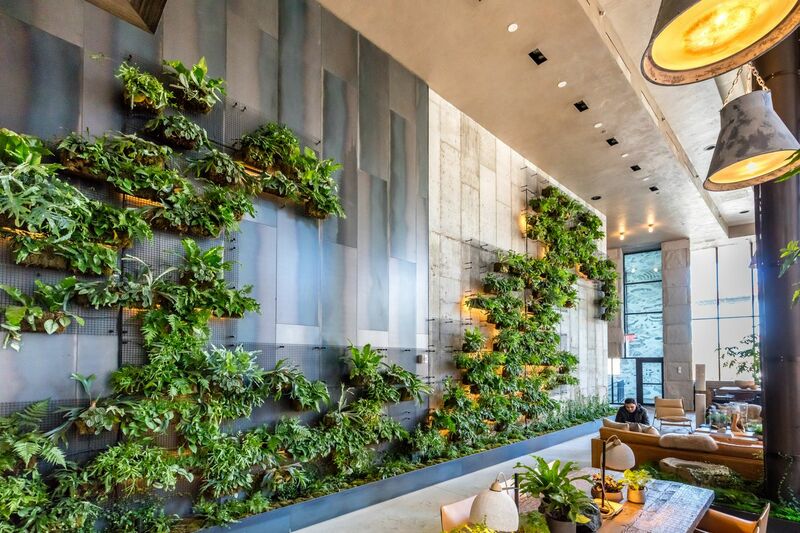 Upon arrival at 1 Brooklyn Bridge, you’ll be entranced by the lobby’s 25 foot green wall, compliments of landscape architecture firm Harrison Green. Comprised of steel grating adorned with hand-placed plants and ever-growing vines, this greenery might have you feeling more connected with Mother Nature than when you were standing outside. This lush display is contrasted by an industrial spiral staircase that climbs two stories and features an obsidian rock boulder sculpture. 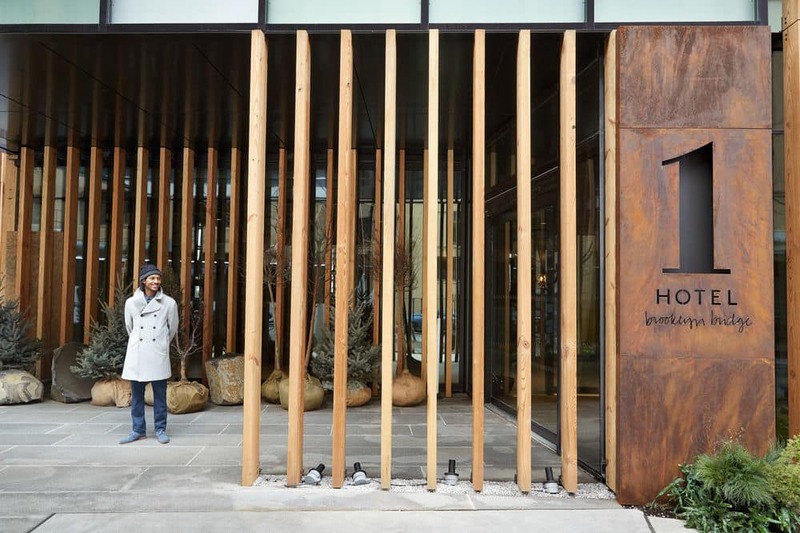 This man-made meets Earth-given vibe permeates the entire hotel and lends perfectly to the eco-luxe ambience. Such chic and yet functional surroundings were no coincidence of course. 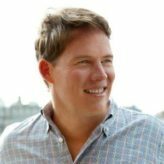 According to founder Barry Sternlicht, the careful curation of every material and an overall focus on retaining the hotel’s purpose to both serve and inspire guests helped shape his vision for the space. Lest you think such talk is all for show, lets delve into the myriad ways this brand is walking the walk of their eco-friendly, wellness boosting mission. 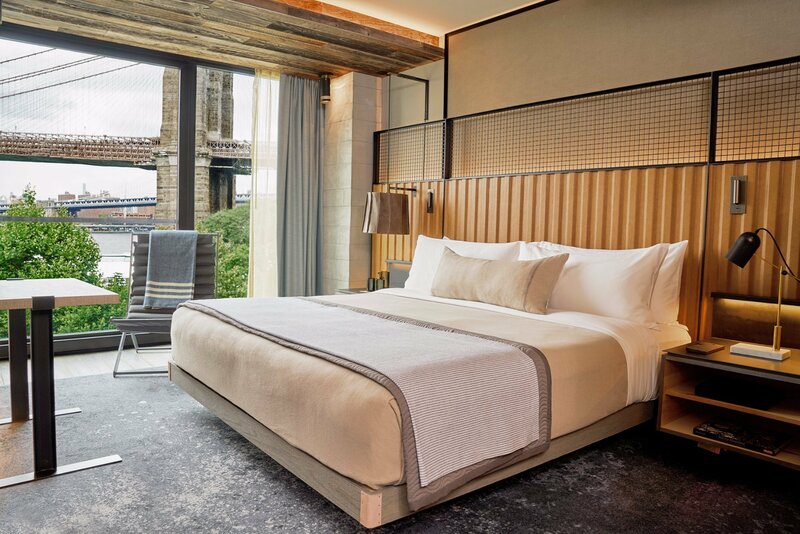 It all starts with the design of the hotel itself, which features a 54 percent ratio of regional and reclaimed materials. The pine beams you’ll be admiring are from the former Domino Sugar Factory and the walnut comes straight from Brooklyn Botanical Gardens. Design can’t go far without function, though, and 1 Brooklyn Bridge’s smooth operation doesn’t come at the expense of the environment. The property utilizes 100 percent wind power energy and features low-energy light bulbs, in-room recycling bins and a Triple Clear water purification system. Speaking of H20, the hotel operates a rain-water reclamation system that will reduce storm water runoff into neighboring streams over 50 percent and instead be used to irrigate Brooklyn Bridge Park during the summer. Nature isn’t hogging all the benefits, either—the property has also committed to donating a portion of in-room dining sales to the global humanitarian organization Action Against Hunger. As a guest, they’ve got you covered on all fronts. You’ll have access to a 24-hour fitness center that includes both barre and yoga studios. You can receive complimentary rides in a Tesla, or bring your bike and valet park it. 1 Brooklyn Bridge is even pet-friendly, so no need to fret about your pooch while traveling. Every Friday and Saturday night, the lobby plays host to live music, to be enjoyed with botanical cocktails and seasonal fare. If you’re an astrology enthusiast or holism devotee , the hotel raises awareness for global brightening one night per month by dimming the lights and leading a candlelit evening of special readings and healings by Brooklyn’s own Maha Rose Center for Healing. The property may have opened late this winter, but it’s really coming into its own this spring. Newly debuting this month is a welcome addition to the city’s rooftop pool scene. Guests and locals alike are welcome to enjoy the 3-foot lounge pool, full-service bar (craft cocktails, of course) and fire pits that this 4,000-square-foot retreat offers. Also opening in May is a sleek but comfy 10th Floor Lounge space featuring furniture by local artist Fernando Mastrangelo. Their signature restaurant is set to debut soon, as well, but details are still forthcoming. For now, you can nosh at Neighbors, a picnic-style café that offers fresh, healthy and seasonal fare. 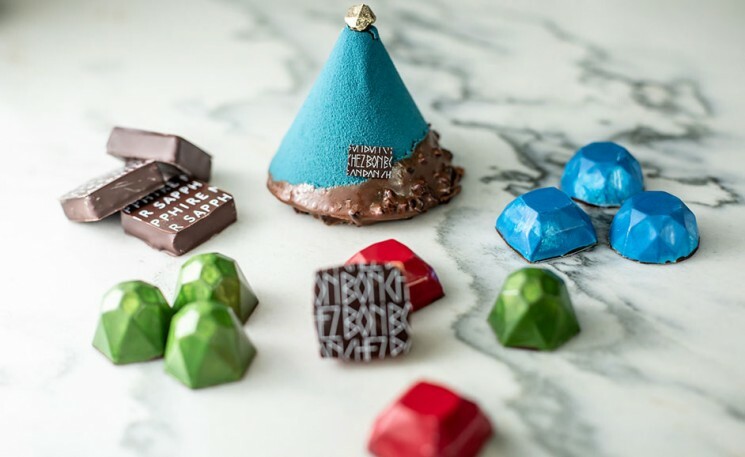 Out-of-towners, don’t forget to pick up a local treat from the selection of Brooklyn artisanal goods (talkin’ The Salty Road Taffy and Butter & Scotch Cookies). For the more om-inclined, Fall 2017 will usher in the opening of the Bamford Haybarn Spa, a holistic retreat for all the senses. Suffice to say, we think we’ve found the perfect place for you to celebrate Fourth of July this year—with one of the best fireworks views, to boot. 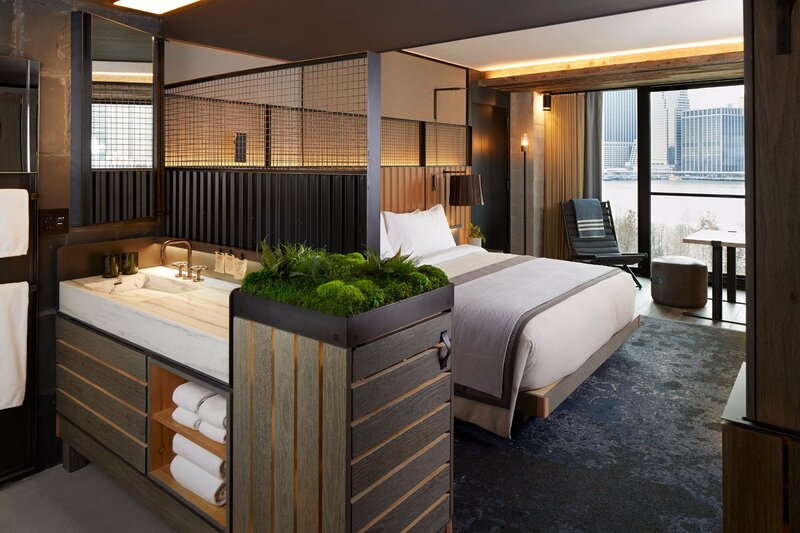 Whether you’re flying in for an extended stay or looking to book a relaxing staycation, 1 Hotel Brooklyn Bridge has quickly made itself a contender in one of the world’s most competitive hospitality markets. If you’re coming in the next month or so, we love the “Hello Brooklyn” package that is available through June 30, 2017. You’ll get a complimentary upgrade, a $25 food/drink credit to Neighbors café, and your choice of a $10 Lyft credit or two ferry passes. Check out 1hotels.com/Brooklyn-bridge/offers for the most up-to-date deals. We’ll see you on the other side (of the bridge).